Losing Sessions – Expect Them! Late last year I had a request for more examples of losing trades, which led to the article series "Winning through Losing Better" (see part one and part two if you missed this popular article series). Let's take that concept further and look at a losing session, and see if we can find a couple of lessons. Let's examine my most recent losing session, last Monday. 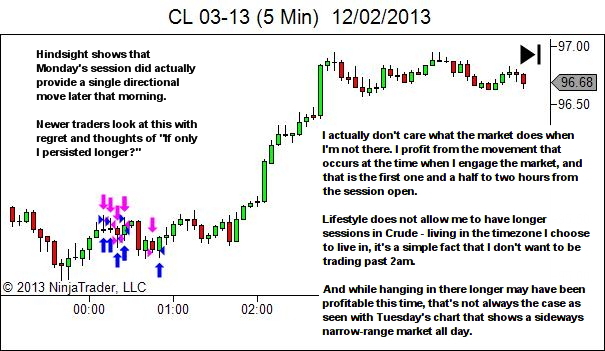 This is the five-minute chart of Crude Oil for the first two hours from session open at 09:00ET (midnight chart time). And let's see how the following day went; again with a five-minute chart. I expect many trades to lose. But provided the loss is limited such that it can be more than overcome by one winning trade, then this loss is of no major concern. I expect many sessions to lose. But provided the loss is limited such that it can be more than overcome by one winning session, then this loss is of no major concern. I expect occasional weeks to lose. But provided the loss is limited such that it can be more than overcome by one winning week, then this loss is of no major concern. I accept losing sessions. And I expect losing sessions. That doesn't mean I like them. I'd prefer they don't happen at all. That also doesn't mean that I don't review them. I certainly do. If the loss is a result of error or violation of my trading plan, then I want to know about this in order to drive further improvement. But what acceptance does offer me is the assurance that I will not make the situation worse by panicking, leading to overtrading in an unsuitable environment in a desperate attempt to dig the session out of it's hole. Failure to accept the reality of losing sessions only serves to increase the likelihood of greater session drawdowns. A novice will self-destruct as he compounds his losses. Whereas I can walk away, accept the loss, and live to fight another day. 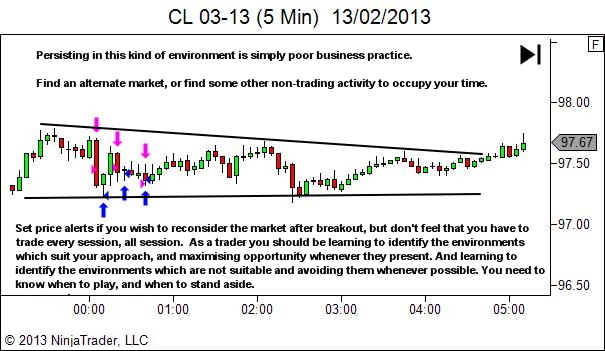 Consider whether or not a similar mindset would be relevant and useful in your trading. Your job is not to win on every trading session. Your job is to win over the long haul. So accept losing sessions. And expect them. Consider whether or not you can learn to identify an unsuitable trading environment earlier, allowing you to walk away or reduce exposure before losses get out of hand. Combining both sessions provides us with some really poor stats. Only two out of nine trades were winners. That's a win rate of 22.22%. Search all the forums and you'll find an obsession amongst new traders with win percentages. Certainly that's understandable, but the fact is that it's not the only important statistic. Our expectancy is a function of not just win percentage, but also the win/loss size ratio. See here for a discussion of the expectancy formula. 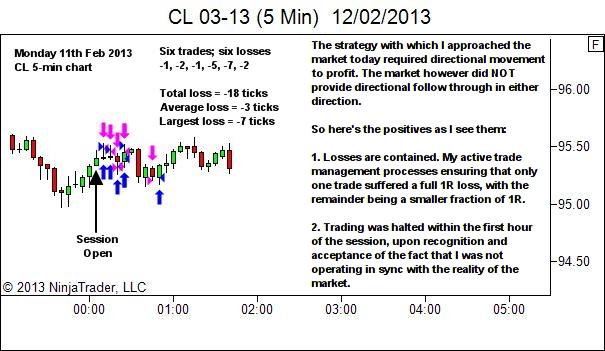 In this sample of trades, our seven losers provided an average loss of 3 ticks. And our two winners provided an average win of 13 ticks. This is a win/loss size ratio of 4.33 to 1; enough to provide a positive result over the two sessions. Naturally I don't have any desire to trade the rest of my life with a 22.22% win rate. But I don't expect I will have to either. This is not the norm; it's just what happens from time to time when my trading is not in sync with the market. The key point is that my trade management processes are designed to keep the losses tight and keep the winners many times greater. This again helps with mindset. Knowing that any losses incurred can be more easily overcome, allows for a confident mindset when I return the following day. Examine your trading stats. Do you need to improve your win/loss size ratio? There's one more obvious lesson that jumps out at me… the importance of not being concerned with missed opportunity. Regret over missed opportunity is particularly dangerous as it interferes with your mindset the next day, increasing the likelihood of poor trading. 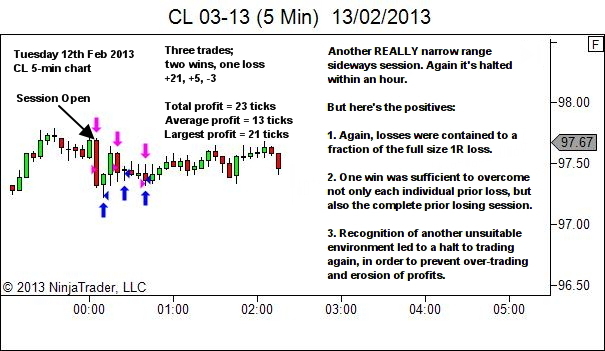 How does missed opportunity, outside of your planned trading hours, impact your mindset going into the next session? If it has any negative impact at all, examine the feelings, thoughts and beliefs underlying this issue. There is a breakthrough awaiting you if you take the time to explore your fear of missing out. In the last image, you suggest looking for an alternate market if the market environment on your preferred contract isn’t acting in a trade-friendly manner – does that mean that you’re tracking other contracts out of the open? If so, how quickly are you usually able to identify a better environment and make the switch? Typically that decision will be made within the first hour. That’s just my way though, with the decision influenced by the poor timezone I inhabit. Others may prefer to look for alternate markets. I don’t.